Puffed sleeves are no longer limited to fancy ball gowns and formal wear. The volumous design has worked its way into your day-to-day looks. Antthony's ruffle-sleeve top can be worked into your wardrobe no matter what your style vibe, shape or size. Love, Love, Love this Top! I ordered this top in black, red and purple. Have to admit, I like the purple top the best. The color is outstanding ..... no one does the color purple like Antthony.....perfect! 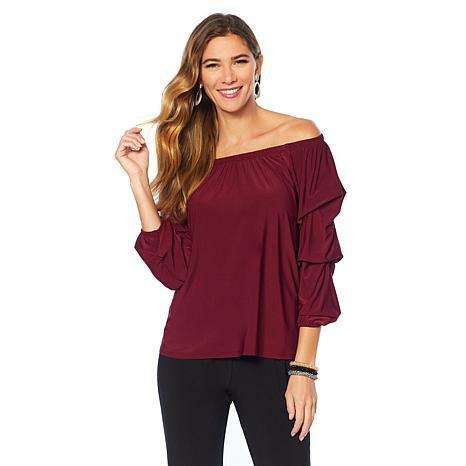 The style is right on trend, on or off the shoulder (looks great either way) and so comfortable. Keep up the good job Antthony. I was so pleasantly surprised when this blouse arrived. It fits beautifully and looks great. I will be wearing it on vacation for sure ! Loved the look and fit of this top. Glad I purchased it! When I saw these tops they had to be mine! Love the fun, flirty (on or off shoulder), stylish look. Fit nicely in a Med size and they can be worn back with just about anything. Got a few and planning on wearing them casually and with some accessories for a dressier look. Great material, fit and price, and you can't go wrong, so give it a try.